The response is usually something like, “Oh, that’s cool, I have never heard of those before,” or “Wait a minute, are those the things people bring to baby showers? I think I know what they are.” Either way, the conversation continues on from there, and I either explain more (if they ask) or we move on to different topics. It got me thinking about how there are many people who have never heard of a diaper cake, and don’t even know that they can make some of the most memorable, and unique baby shower gifts that you can possibly give. So, with that in mind, I want to take the opportunity to set the record straight, explain what diaper cakes are, and put the word out there for those of you looking to learn more about them. Well, I think it’s fair to say the diaper cake is a “girl” thing. There aren’t many men who are aware of them, primarily because they are popular at baby showers, and traditionally, the baby shower is about the mom and her friends. This isn’t universal, of course: more and more dads are starting to take an interest in the planning and attendance of the baby shower, because they truly want to share every aspect of their baby’s life with their spouse. I did some online searches and research, and where baby cakes first originated from, and who first made them, isn’t abundantly clear. However, it’s assumed that they were made even before disposable diapers became mainstream. Of course, back then, cloth diapers were used and probably glass baby bottles, as plastic bottles were generally not available at the time. It’s also assumed that the inventors of diaper cake were woman who enjoyed crafting, and as such, made these for friends and family members who were pregnant. Finally, it’s pretty safe to assume that there weren’t any for profit businesses making diaper cakes like there are today. I went back to the earliest days of Lil Baby Cakes (Oct 2, 1999) and pick up the diaper cake image shown on the right. This was one of the first diaper cakes created on the site at the time. Back then, you can see a baby bottle, Q-tips, ribbons and bows, and a cellophane wrap to present as a gift to the new mom. We’ve come a long way since then, but what makes us truly unique and special today was true, even back then. We crafted that cake with extra care, paying special attention to even the tiniest details, and made it as beautiful as we could. We do the exact same thing today, with every cake we make. Over the years, the designs have evolved to include plush toys and a host of other “goodies” for the mom. I’m sure you may have seen pictures of diaper cakes made with a champagne bottle in the center, along with the diapers, as a way to give the mom something to care for the newborn, plus of course the champagne for the parents to enjoy once mommy can start drinking again. I’ve seen motorcycles, airplanes, topsy-turvey, and a host of other designs all cleverly created with diapers. However, just like a traditional wedding cake has its tiers, so does the “traditional” diaper cake, and I feel most comfortable with this style for many reasons. For one thing, styling a diaper cake in the “traditional form” makes it instantly recognizable as a cake, even if guests are a little startled when they discover they can’t eat it! We tend to associate these cakes with special occasions, like weddings, anniversaries, and of course, new babies. By intentionally keeping that same shape, I’m able to capture the emotions that these cakes foster, and enhance them even more with a fun twist of my own! More practically, the tiered system allows me to craft some amazing, gorgeous looking cakes that won’t fall apart the minute they’re touched. Since we have to ship our wonderful cakes to many different places, I want my customers to know that their cake will arrive in perfect condition. In closing, I thought I would address one final comment that I tend to get from folks I have talked to since I started Lil’ Baby Cakes. Believe it or not, I still get the occasional question asking whether or not you have to refrigerate the diaper cake. Now, maybe these folks are just pulling my leg, or maybe they are just making wise cracks. However, it has happened enough times that I sometimes wonder if people do get confused about exactly what a diaper cake is. By the way: the answer is no – you don’t have to refrigerate them. As 2018 closes down I would like to wish you a Happy New Year. I look forward to creating many more new designs next year all Lil’ Baby Cakes style! Best wishes for a great 2019! Planning a baby shower? Make your event even more memorable by designing the theme around a beloved gift: books! Book-themed baby showers have become increasingly popular over the last few years, and even Martha Stewart has raved about them. They’re perfect for any expectant mom (we all want to inspire little readers, right? ), but especially for book lovers. Whether you’re planning a baby shower for a coworker, a friend or a family member, a book theme will make your event super-cute—and it’s easy to do, too. Here are some tips on how to do it right. Why consider a book-themed baby shower? Let’s start with the basics: what makes a “book baby shower” so special, anyway? Books already make great gifts for moms-to-be and their newborns. And by creating the theme of your shower around books, you can get even more creative with the decorations, invitations, shower activities and other aspects of the event. Reading is a great way for parents to bond with their baby, starting right after birth. In fact, research shows “reading books with a child beginning in early infancy can boost vocabulary and reading skills four years later,” according to the American Academy of Pediatrics. Brand-new books can be expensive for parents, so they tend to get de-prioritized below more urgent items, like diapers and clothes. A book-themed shower ensures that the new parents will have lots of books for their baby as she grows. If there’s one gift that book lovers love more than anything else, it’s books! Naturally, that goes for their babies, too. If you know an expecting mom who is also a bookworm, then you know she’ll adore a book-themed baby shower—because she can’t wait to begin reading to her newborn. Book-themed baby showers are easy to plan—even if you’re planning it at the last minute. The books themselves, and the characters within them, offer limitless ideas for decorations and gifts. And you don’t have to spend a lot of money either. Ready to get started? Let’s dive in! Here are several easy ways to make your baby shower more special with books. Let guests know! Use the baby shower invitations to introduce the theme and briefly explain the idea. You can incorporate book images (or famous characters from children’s literature) into the design. Some ambitious planners choose to make the invitations look like a book cover or even an old-fashioned library card. Both are wonderfully creative ideas, but don’t feel obligated to go that far if you don’t have time or design skills. On the invitations, suggest that books are a recommended gift for the mom-to-be. Important: if they choose to buy a book, it should be in addition to the items already on the mom’s registry. The idea isn’t to ask people to spend a ton of money. But if they can afford to spend a few extra dollars on a board book, that would be wonderful! Consider making a cute message for your shower that you can incorporate into the invitations, decorations and so on. Sort of like a tagline, but with a play on words about books. You get the idea. The cuter, the better! Books offer so many possibilities for your baby decorations. Beyond book characters (see #5), you can create a more minimalist vibe by decorating with light-colored paper, hung on clothesline-like string to create a garland. With strong enough string, you can even hang books. Need some more inspiration for decorations? You can’t go wrong with images of beloved characters from classic children’s stories, like Winnie the Pooh, Madeline, The Cat in the Hat, Paddington, Stuart Little, and so on. You should be able to find pre-made decorations with these characters. Or, if you’re feeling crafty, you can make them yourself. No need to go overboard. You can even make the theme around a single character to keep things simple. Once again, the books themselves provide a wealth of inspiration for decorating! Consider scanning pages from classics and print them to use as table decorations, garlands, wall décor and so on. There’s something so inviting (and adorable) about walking into a room decorated with images of beloved book characters from your childhood. Baby diaper cakes make great gifts for expecting parents and wonderfully unique centerpieces for baby showers. Plus, you can even find some diaper cakes that include actual books and are designed with themes from children’s literature—so that it matches the theme of your shower. Jump below for even more reasons why these cakes are so special. If guests are bringing books, they why not incorporate them into the décor? Books are perfect for dressing up the food table, gift table and guest tables. They fill in those annoying bare spots without requiring you to buy additional decorations. For larger showers, where lots of food will be served, let people know what they’re eating with book-themed menus. We’ve seen some showers that used a stack of books, covered with paper and listed with the menu food items on the spines. Or, you can include a paper menu on every table, written in prose like a story. It’s easy to create an impressive spread of food and snacks at your baby shower, especially when you use children’s books as inspiration. We’ve seen some very clever ideas related to classics like Cloudy with a Chance of Meatballs, If You Give a Mouse a Cookie, Blueberries for Sal and so on. Use a book holder to display the book next to the food, so guests can see the connection. Classic nursery rhymes and songs are more great sources of inspiration for decorations and themes. Humpty Dumpty, Mary Had a Little Lamb, Little Bo Peep, The Muffin Man and Three Blind Mice are just a few of the many stories that lend well to shower motifs, foods and games. Thank your guests for coming (and for playing along with your book-themed antics) with book-themed party favors. These could be anything from custom-made bookmarks to $5 gift certificates to the local bookstore. Diaper cakes aren’t just nice to look at. They’re made with real diapers—the items parents need most! This makes the cakes practical in addition to being beautiful. The cake serves its decorating purpose at the event, then continues being useful to the parents when they take it home. They’re adorable! Few things evoke more “awws” than diaper cakes. When they’re designed with cute colors, gifts for baby and other whimsical embellishments, their adorableness is almost too much! As we mentioned above, you can coordinate your diaper cake with your book-themed baby shower by choosing one that is designed with books! At Lil’ Baby Cakes, we’ve offered numerous book-themed diaper cakes, such as our Peter Rabbit Diaper Cake, Goodnight Moon and others. If you don’t find exactly what you’re looking for, you can choose another style and add your own book-themed decorations to it. Diaper cakes are great for work/office baby showers, as well as showers with friends and family. Even if you’re not throwing a shower at all, the cakes make great gifts that you can send directly to parents. Which children’s books are the best? Don’t worry if you’re not familiar with the classics. We’ve mentioned a few popular titles above, but you can find lots of recommended lists online. Scholastic, for instance, has put together a handy list of the 100 Greatest Books for Kids. It includes titles for all ages, from Goodnight Moon to Harry Potter. Don’t be afraid to give some books that a child won’t be able to read until they’re much older. Moms and Dads—especially the bookworms—will love being able to read to their child as soon as they’re born. Remember, a book-themed baby shower doesn’t have to be extravagant or expensive. If there’s a limited budget for decorations and gifts, ask guests to bring a gently-used book that their own children don’t use anymore. You can also find inexpensive books at thrift shops and used bookstores. No matter how adventurous your theme, the idea is to have fun and help the proud mom to-be celebrate the exciting next chapter of her life. I believe that the best baby showers reflect not only the excitement of the parents-to-be but also their passions and personality. 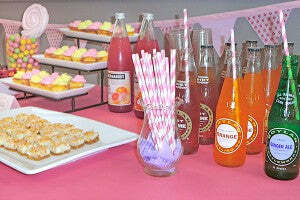 In 2014, baby shower themes will no longer just be about the colors pink, blue or pale green. These showers will be events that tell the story of the past of the parents and their future hopes for their new bundle of joy. The Hot Air Balloon Shower — The hot air balloon is one of the hottest nursery themes and baby shower themes of 2014. This theme is filled with whimsy, and is perfect for parents who have sky-high hopes for their new baby. Use cake pops that look like balloons for dessert and decorate with plenty of real balloons. The Gender Reveal Shower — Many couples today find out whether they are having a little boy or a girl long before the baby is born. Announcing this big news at the shower can be great fun. Plan a shower game that requires guests to guess the gender of the baby. Have the parents-to-be open up a box filled with either pink or blue balloons to make the announcement. The Shower with Elephants — Forget the owl — 2014 is all about the elephant. This nurturing yet strong creature is the perfect symbol for a new life, and best of all it is gender neutral. The Heritage Shower — I’ve found that many couples are starting to honor their past as they plan for the future. A heritage shower is a great way to celebrate a baby’s background. For instance, a Scottish shower can be filled with tartan decorations and shortbread can be served for dessert. The Vintage Shower — Go back a few decades and throw the perfect vintage shower for that special mom-to-be in your life. Play old-fashioned baby shower games and use the pram and vintage baby rattles as decorations for this shower. Whether the mom-to-be is expecting a little bouncing baby boy or a tiny sweet baby girl, she deserves the celebration of a lifetime. This is a big moment in any person’s life, and I have found that friends and family love to share in the joy of this exciting time. In 2014, expect to see expertly-planned baby showers that are inspired by symbols of hope for the next generation.